Sorry for the mess we are busy learning. As a pre-school teacher this little sign was neatly decorated on my door, because it was true. My room was messy by adult standards, but to my little kiddos it was perfect. Sure, every day after class ended I would have to go and clean the toys and put them back where they went. It didn’t matter because the kids helped me put everything away. So the same has easily translated to the littles I nanny for. As your nanny you can always expect that toys will be put away before we leave. That I will try my best to model to them that everything has a home. When we put toys away after each use the next time we play with them they will have all the pieces. It is never fun to do a puzzle and be missing one piece!! Plus, it shows kids that our toys, games, stuffed animals were bought with love and should be treated with love. 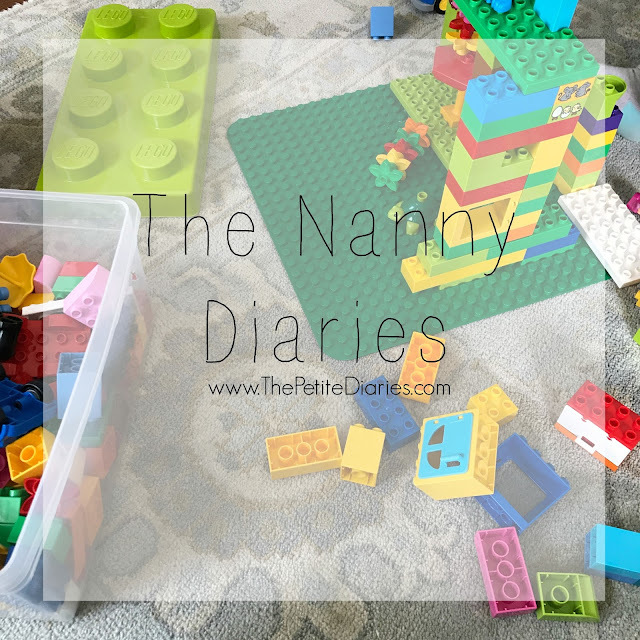 Have a MESSY MESSY playroom and your toddler just wont help you clean it? I use these two phrases and it really seems to work. I say: What two songs shall we listen to while clean up our mess? I swear it works every time! It’s so ingrained into the girls, that I get reminded if we don’t have a song playing. The song is a gentle reminder that while it’s on we have to clean up! Why say this: Giving your children control in the situation allows them to make the choice to want to help. It also, offers you control because the songs are like a timer for the job and then everyone is rewarded. I say: I remember having to clean up when I was little, how can I help you? Why say this: Feelings need to be validated. Having to clean up your toys is hard, but letting them know you’ve been there gains trust. Having a certain feeling toward doing something is okay, that even when we don't want to do something sometimes we still have to. Promise a reward. I tell them if they cleaned up, and we did it the RIGHT way, they would get a special treat. We started with one section at a time. I gave them each a job. As they completed them, I gave them another. Before you know it, messy room all cleaned up! So tell me nannies, mammas or papas how do you get your littles to clean up?! These are good tips, and I'll have to put them into practice! We try the 'one toy out at a time' rule but that doesn't always happen as I'll go into the kitchen to cook dinner and find they've pulled out a bunch of different toys, haha! We do have the rule that they have to have all their toys tidied before lunch or dinner, as that's the same rule they have at daycare, but it can be tricky getting them to do it quickly sometimes. Always more fun to make a mess than to tidy it away, haha!